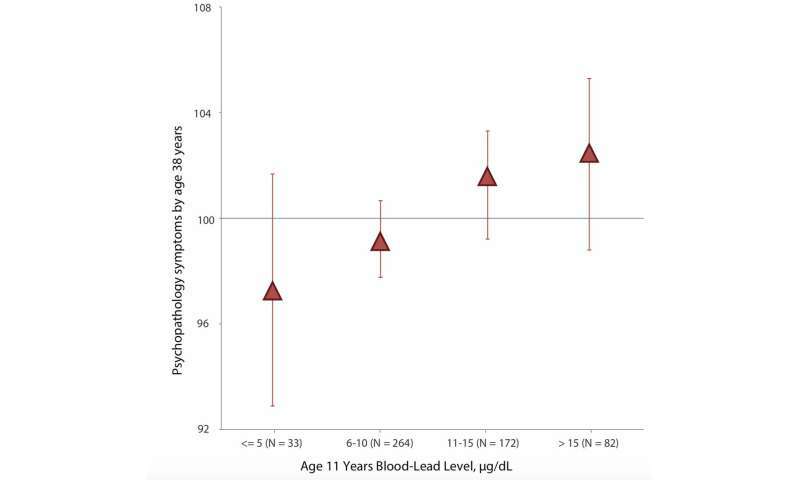 Higher blood lead levels at age 11 are linked to an increase in symptoms of psychopathology and difficult personality traits by age 38. Credit: Adapted from JAMA Psychiatry, 2019;76(4):1-9. The findings, which will appear Jan. 23 in JAMA Psychiatry, reveal that the higher a person's blood lead levels at age 11, the more likely they are to show signs of mental illness and difficult personality traits by age 38. The link between mental health and lead exposure is modest, according to study coauthor Aaron Reuben, a graduate student in clinical psychology at Duke University. But "it's potentially important because this is a modifiable risk factor that at one point in time everyone was exposed to, and now, certain people in certain cities and countries are still exposed to," he said. Both sets of findings suggest that lead's "effects really can last for quite a long time, in this case three to four decades," said coauthor Jonathan Schaefer, also a graduate student in clinical psychology at Duke. "Lead exposure decades ago may be harming the mental health of people today who are in their 40s and 50s." Researchers measured blood lead levels—in micrograms per deciliter of blood (ug/dL)—when participants were 11 years old. Today, blood lead levels above 5 ug/dL will trigger additional clinical follow-up of a child. At age 11, 94 percent of participants in the Dunedin Study had blood lead levels above this cutoff. The Duke research team also assessed participant mental health and personality at various points throughout their lives, most recently at age 38. 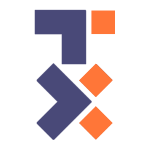 Diagnostic criteria or symptoms associated with eleven different psychiatric disorders—dependence on alcohol, cannabis, tobacco, or hard drugs; conduct disorder, major depression, generalized anxiety disorder, fears and phobias, obsessive-compulsive disorder, mania, and schizophrenia—were used to calculate a single measure of mental health, called the psychopathology factor, or "p-factor" for short. How do the researchers manage to correlate exposure to the TetraEthyl-Lead of gasoline that made the exposure numbers so high? Lots of other sources exist, such as lead paint, lead used in ceramics and glass, etc. I ask because not many children from that era would have been pumping gas from a leaded gas pump. Are they suggesting fumes from the gasoline are the culprit?